The surtaxed French stamps of 1927 to 1931 were all either overprinted or inscribed "Caisse d'Amortissement", meaning "Amortization Fund" or "Sinking Fund". These are not actually what one would call "charity" stamps, unless one considers the French government a charity. Considering their purpose, they would probably be better looked upon as revenue stamps. Europe, during the 1920's, was going through a period of immense economic hardship, with many European economies being crippled by hyper-inflation, and by the uncontrolled deflation of national currencies. The Great Depression began near the end of the decade, which made European economic problems even worse. Very simply stated, the sinking fund was a postal tax established to stabilize the French Franc and to help pay down the French national debt. With the help of this fund, the French economy came through the Great Depression in pretty good shape, whereas the economies of other major European nations collapsed. This practice may seem a bit draconian to some, but many other countries have done basically the same thing. In a similar effort to fund two world wars during the 20th Century, the United States issued Savings Stamps and War Savings Stamps that could be collected and redeemed by the public towards the purchase of government bonds. The Semeuse Type and Pasteur Type definitive stamps shown above (Y&T #246-48, Sc. #B24-26) were issued on September 26, 1927. They are overprinted Caisse / d'Amortissement (or C / A) and surcharged for the Sinking Fund. The Semeuse Type and Pasteur Type definitive stamps shown above (Y&T #249-51, Sc. #B28-30) were issued on October 1, 1928. They are overprinted Caisse / d'Amortissement (or C / A) and surcharged for the Sinking Fund. The Semeuse Type and Pasteur Type definitive stamps shown above (Y&T #253-55, Sc. #B31-33) were issued on October 1, 1929. They are overprinted Caisse / d'Amortissement (or C / A) and surcharged for the Sinking Fund. The engraved, wide format, pictorial stamp shown above (Y&T #256, Sc. #B34) was issued on March 15, 1930, with the 3.50 Fr. surtax being for the Sinking Fund. 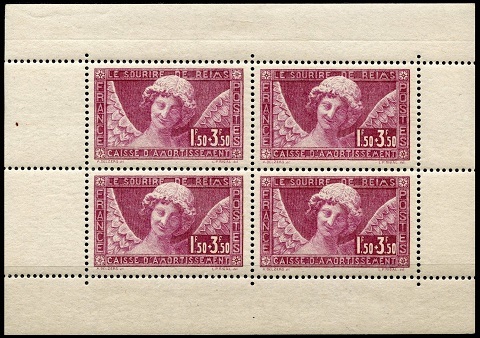 The design of this very popular French stamp features the famous "Smile of Reims". The Smiling Angel, also known as the Smile of Reims is a stone sculpture, located in the north portal of the western facade of Reims Cathedral, which was built during the 13th Century. 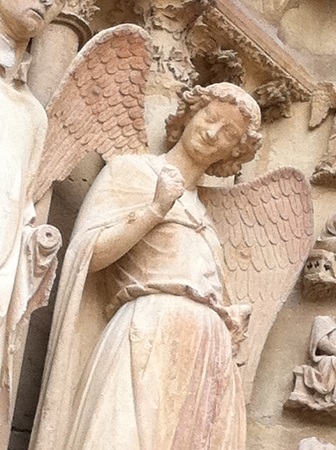 Being that Gothic architecture and sculpture was usually very austere, the presence of this smiling angel is both surprising and unique. The sculpture was beheaded, when the cathedral was bombed on September 19, 1914. After World War I, the fragments of the head were re-molded and kept in a Paris museum. The sculpture was finally restored and put back into its original location on February 13, 1926. This stamp was also issued in booklets. A pane of four stamps is shown directly above. The Semeuse Type definitive stamps shown above (Y&T #266-68, Sc. #B35-37) were issued on October 1, 1930. They are overprinted Caisse / d'Amortissement and surcharged for the Sinking Fund. The Semeuse Type definitive stamps shown above (Y&T #275-77, Sc. #B39-41) were issued on October 1, 1931. They are overprinted Caisse / d'Amortissement and surcharged for the Sinking Fund. Dangerous forgeries exist for most of the Sinking Fund overprints shown above. Forgeries of authentication markings on these stamps exist as well. In my search of philatelic articles, the general rule given for these overprinted French stamps is .... "if the stamp's catalog value is higher than that of the un-overprinted stamp" .... one must consider its authenticity. Some of the comments indicated that the "forged overprints quite often look BETTER than the original overprints". The beautifully engraved, wide format, pictorial stamp (Y&T #252, Sc. #B27) shown above was issued during May 1928, with the 8.50 Fr. surtax being for the Sinking Fund. This French stamp was printed in both Dull Blue and in Blue Green, with the Blue Green shade being very scarce. The design features allegorical representations of Industry and Agriculture. The engraved, wide format, pictorial stamp shown above (Y&T #269, Sc. #B38) was issued on March 1, 1931, with the 3.50 Fr. surtax being for the Sinking Fund. The design features young women in an allegorical representation of the French Provinces.